Upon arrival at Pearson International Airport make your way to your hotel. 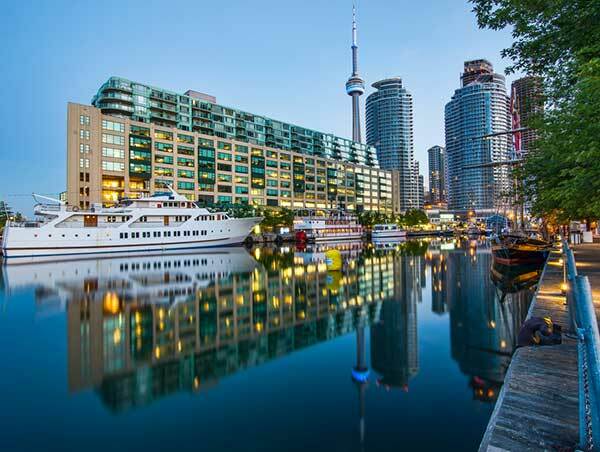 Enjoy a day at leisure in Toronto, which offers a vast array of museums and galleries, interesting ethnic neighbourhoods, a beautiful waterfront and excellent shopping. Make your own way to the train station for boarding of VIA Rail train. Sit back and enjoy a 4h30 scenic rail journey. Upon arrival in Ottawa transfer independently to your hotel. Free day to enjoy Canadaâ€™s Capital. Ottawa is a place where you can immerse yourself in Canadian culture. Make your own way to the Ottawa rail station for boarding of VIA Rail train. Sit back and enjoy 2 hour rail journey through Canadaâ€™s heartland. Upon arrival in Montreal transfer independently by taxi to your hotel. excellent shopping, lively nightlife, rich culture and history. Come aboard and discover the metropolis like youâ€™ve never seen it before! Relive a page of history with our famous explorer Paul Chomedey de Maisonneuve who will fascinate you with his anecdotes and historical facts. Make your own way to the Montreal rail station and boarding of VIA Rail train. Going through villages and farmlands, your 3 hour rail journey will take you to Quebec City. Upon arrival in Quebec City transfer independently to your hotel. Spend the day at leisure exploring this charming historic walled city, the first French settlement in North America. Tour ends. Make your own way to the rail station for your return journey to Montreal and on to Montreal airport for your return flight. VIA rail (economy class) from Toronto to Ottawa one way, Ottawa to Montreal one way, Montreal to Quebec City return. Montreal 1.5 hour day cruise. Document pack at hotel on arrival with maps and brochures. Gratuities to drivers, on board trainÂ staff and porters.